No experience, but wishing to make a skydive? No problem! 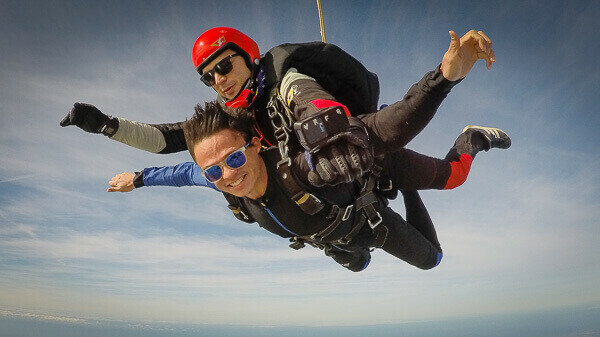 Millions of people make tandem skydives every year! Have one of our professional instructors take you for the adventure of a lifetime! The most popular skydive jump in the world, and an ideal first jump or holiday experience. A tandem jump is our most popular and the ideal way to skydiving for the first time, you don’t need any experience at all. All the expert instructors have thousands of skydives, and you will jump using a large parachute specifically designed for two people. There’s a short ride on a specialist parachuting aircraft before you take an exhilarating leap from 15,000ft, reaching terminal velocity at around 120mph! Your instructor will then open the tandem parachute after 70 seconds of free-falling and fly you safely back. We offer an optional outside video and photo package, from handycam option which is a camera used on the wrist of your tandem instructor, or with an external cameraflyer. Are you ready to experience the thrill of a lifetime? 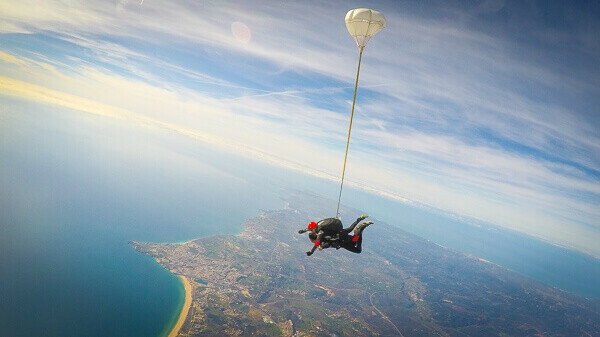 Great news, you’re just a few clicks away from Skydiving at Algarve. T-Shirt as Skydiving Gift ! Booking Deposit from 30€ to 100€. On the experience day you pay the remaining amount. There’s no reason to be intimidated. Our focus is to ensure you have a great experience in a relaxed and fun environment. Enjoy the Best Skydiving Views at Algarve Cost. The price is for person. We have special prices for groups and family pack. Contact us! HANDYCAM SERVICE PLUS EXTERNAL CAMERA-FLYER! HD 4k Video and Photos from Handycam plus an External Skydiver Cameraflyer with photos and vídeo camera. More 400 Photos + TShirt. Can I take part in a Tandem Jump? Minimum age 16 – parental consent required for 16/17. Read this note: Those aged, from 16 to 17 travelling without a parent present will require notarised consent from both parents if applicable. Maximum weight 100kg (220lbs/15.7stone) fully clothed. Skydiving requires a basic and reasonable amount of fitness to take part. Bring comfortable clothing and trainers – If you don’t have with you, we provide! Ready to live an unforgettable experience? Book your tandem skydive in the beautiful coastline of Algarve? Aerial Experiences Experts, for your Holiday Adventure or Tourism Agency. Skydive, Scenic Flights, Aerial Messages from Lisbon, Algarve and Alentejo.